We have created a platform with a unique approach to support the mail distribution process. Difoma is specially designed for the bigger operation that distributes addressed mail to the consumer via a subscription. Let the deliverer be perfectly guided throughout their daily journey by having structured delivery point-of-interests in a optimised and natural route. It is extremely valuable to have a complete work order solution in hand. Being able to analyse day-to-day challenges and search for important subscription info directly in the device gives you the value-added features that no other manual solution can offer. A late start is as bad as an early finish. Get the value of monitoring shift activity by realising the efficiency figures of your fleet and scanning the geographical scope of each round walked. You do not want to miss the unexpected things that happens on the road acknowledged by your staff. Let your staff be proactive in the field and be able to directly report key issues in the distribution process to their branch officer. 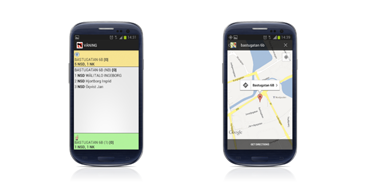 Your work orders are enriched with location and navigation features. 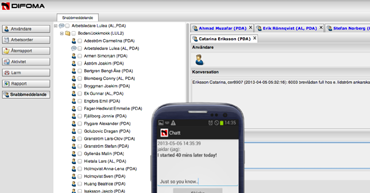 Equip your staff with our mobile panic alarm feature. A manual panic alarm trigger function and automatic alarms that are condition-coded by time and distance will raise security awareness within your organisation. In times of deviation there are great time saving values in corporate communication that allow supervisors to announce critical info instantly to the full crew. Some clients demands a written signature, others a GPS snail trail. Do not limit yourself to one tracking method only. Geofencing, E-Signature, In-App confirmation and barcode scanning are norms of today. We manage all these for you! Usable reports must be intelligent. 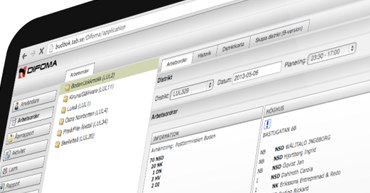 We make sure the reports refelect your operational facts and are actually readable in English. Times, Quantities and Resources lined up with a beautiful layout on a piece of paper after being dug out of millions of rows in just a few seconds is what we are good at. We specialise in reports that are easy to understand and that allow your staff to make the key decisions quickly. Keen to know more about Difoma?